4.08pm: WATER levels at Awoonga dam are decreasing according to Gladstone Area Water Board CEO Jim Grayson. "The levels have been going down for a few hours," Mr Grayson said. The dam is designed to reach water levels of between 43.45m and 47.9m. Today water levels peaked at 48.3m which is the highest level ever recorded. At 4pm the water levels were around 47.6m. Despite the record high water level, the saddle dam wall managed to stay intact. Mr Grayson said an inspection of the saddle dam wall is currently underway. 4.01pm: RESIDENTS affected by flooding caused by ex-Tropical Cyclone Oswald in the Gladstone Regional Council, Banana Shire Council and Bundaberg Regional Council areas can now access assistance from the Queensland Government to aid in their recovery. Communities Minister Tracy Davis said disaster relief arrangements had now been activated in these affected areas. "Personal Hardship Assistance Scheme (PHAS) grants are now available to support those families experiencing personal hardship, by covering the immediate, unexpected basic costs of essential items such as food, clothing and accommodation due to the extreme weather," Ms Davis said. "A grant of up to $180 per person, up to a maximum of $900 for a family of five or more, is available to eligible people experiencing genuine hardship." For more phone the Department of Communities on 1800 173 349. 3.20pm: Authorities have confirmed risks of the Awoonga saddle dam spilling over have now passed. Mayor Gail Sellers said water levels remain high but the dam is safe and working as it should. 2.15pm: The body of an elderly man has been retrieved from water at Burnett Heads, Police Commissioner Ian Stewart has told the press conference. 2.08pm: Premier Campbell Newman is currently holding a press conference in Brisbane regarding flooding in Queensland. Mr Newman said Deputy Premier Tim Nicholls and Local Government Minister David Crisafulli would visit Gladstone this afternoon to see first hand how the flood relief effort was going. He said 20 houses had been inundated at Tannum Sands and 20 at Benaraby. "Awoonga Dam has seen very dramatic levels of water in the dam - 8.5m above normal water level," Mr Newman told the press conference. "The saddle dam has been overtopped. It is eroding as it is meant to, with water going down that flow path. "The dam at this stage is all holding up well." Mr Newman said a decision would be made tomorrow about the first day of school on Tuesday, and parents should keep an ear out for announcements. 1.45pm: Emergency services personnel are assessing the damage caused by flooding throughout the Gladstone region ahead of expected fall in water levels this afternoon. 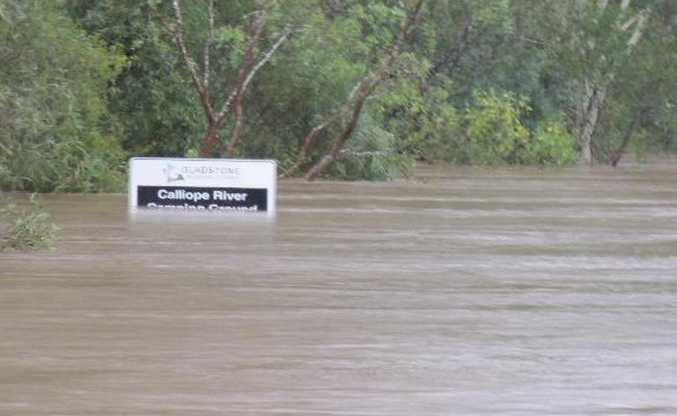 Gladstone Mayor Gail Sellers said the end to heavy rainfall caused by ex Tropical Cyclone Oswald and a drop in flood water levels was encouraging, but cautioned against people moving back into damaged areas prematurely. "All emergency services have personnel assessing damage as they gain access to new areas, many of which are still isolated by high water," Cr Sellers said. 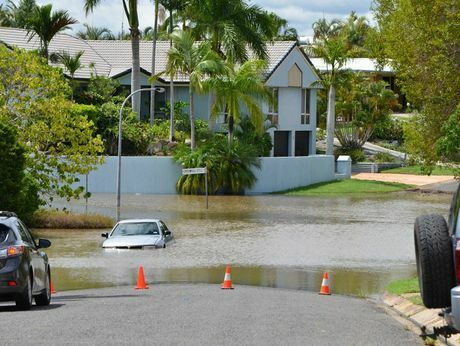 "All agencies, coordinated by the Gladstone Region Local Disaster Management Group, are working through the situation and are assessing the flood related issues on a priority basis. "I can understand those who have evacuated their homes are desperate to get back to their properties, but I can only ask them to be patient as emergency personnel need to assess the affected areas for potential risks before residents can be allowed to return." 1.15pm: Woolworths has assured customers it is working hard to get new stock to stores currently impacted by severe weather conditions. Despite delayed transport due to road closures and flooded rail lines, stock is getting through and is on its way to most impacted stores. Gladstone (Boyne Island) and Biloela stores remain open at this stage but Woolworths will continue to monitor the situation closely. Biloela is experiencing some stock shortages because trucks were not able to get through overnight due to road closures. Operations and logistics teams have escalated the issue and are currently working through options to get stock to the store. 1.10pm: Optus reports there has been minimal impact to Optus mobile infrastructure in Gladstone, with 3G and 2G voice, data and fixed line services including broadband all still available to customers. Optus engineers are in the area and are monitoring the situation closely, with generators available if needed. 11.50am: Sunwater has advised that floodwater releases from Callide and Kroombit Dams are continuing. An additional rise in floodwater is expected over the next few hours at Jambin and Goovigen. Residents in these areas should prepare for increased flood levels. Sunwater said flood levels may be higher than those experienced over the past 24 hours. Residents should not assume the reduction in flood levels will be maintained. 11.44am: Observer reader Noel Harvey reports at least 1350mm of rain has fallen at Siding Rd, Beecher. He said the the total could be higher because the gauge overflowed three times and fell off once. "We Beecher residents are thankful to Lowtian P/L who opened a third way into Beecher from Brendonna end via Jim Whyte Way a few weeks ago," he said. "Clyde Creek at Jeffries Rd was closed until this morning and Clyde Creek at Wyndham Rd was closed Friday night and part of Saturday, so everyone who knew about the new way got home. "All in all, the area coped very well compared to other areas," Mr Harvey said. "And the ants knew. From six months ago until the event, just about everyone has had problems with the ants recently. They should settle down now. 11.10am: The Gladstone Harbour has re-opened to shipping, according to Gladstone regional harbor master Mike Lutze. "But there is a lot of debris floating around the harbor still so I urge extreme caution to small vessels who decide to go out," Captain Lutze said. Small craft vessels are restricted to daylight navigation only. "All the debris can be very dangerous to small boats," Captain Lutze said. 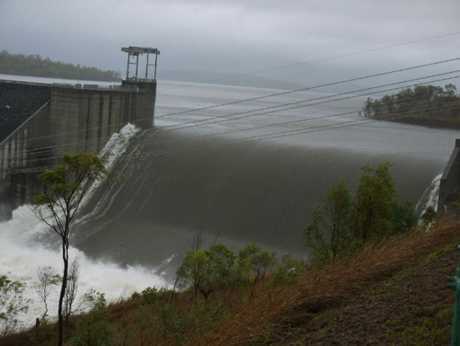 10.45am: LAKE AWOONGA's saddle dam has the potential to break at any time after rainfall sent water toppling over the maximum spillway early this morning. Around 1am the rising water level tipped 8.3m over the auxiliary spillway. Yesterday the dam reached 6m over the spillway, and authorities were expecting it to reach 7.5m by today. Gladstone Area Water Board CEO Jim Grayson said a part of the dam's infrastructure was designed to break away if it accumulated too much water. At this stage the dam is designed to reach water levels of between 43.45m and 47.9m. "The release will not have any adverse effects on the surrounding waterways, but there is a chance the South Trees Inlet and Boyne River could rise as a result," Mr Grayson said. If the saddle dam does break then the possibility of rising flood waters in the Boyne Island, Tannum Sands and Benaraby area is very likely. More here. 9.48am: Further south, motorists are urged to take care due to widespread flooding in the Gympie and South Burnett regions. Many major arterial roads are now cut off due to floodwater including the Mary Valley Highway, Bruce Highway, Tin Can Bay Road, Cooloola Coast Road, Rainbow Beach Road as well as many other smaller roads. Many of these roads are unsigned and motorists are urged to limit all non-essential travel and to stay away from flooded roads. 9.43am: Ergon Energy has reported 550 customers in the Gladstone and Central area are without power. 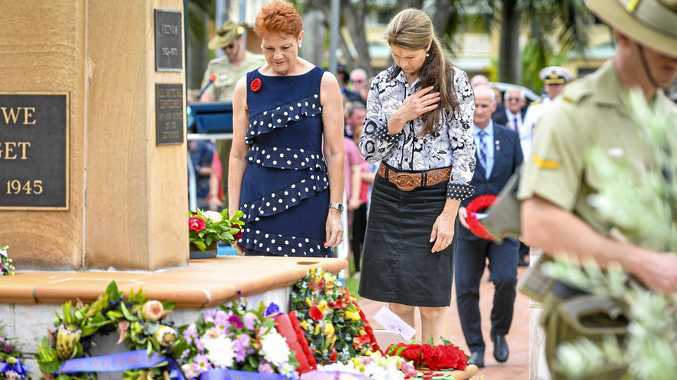 9.30am: Premier Campbell Newman intends to visit Gladstone this week. A representative from the Premier's office said Mr Newman would visit tornado-stricken Bargara today. He will then travel back to Brisbane to attend a Cabinet disaster sub-committee meeting ahead of a press conference at 2pm. It's uncertain what day Mr Newman will arrive in Gladstone, but a spokesperson assured The Observer Mr Newman fully intended to be here. 9.20am: Evacuation centres at Gladstone and Boyne-Tannum filled up overnight. Full story here. 9.08am: Queensland Fire and Rescue Service is asking people to stay well away from Awoonga Dam. Water levels are very high and it's not a day for sightseeing. 9am: Motorists have been advised to avoid heading south to Miriam Vale because the Bruce Highway is closed between Miriam Vale and Gin Gin, and there are long delays of 6-8 hours expected. The closure is expected to last several days while repair work continues. 8.45am: Queensland Fire and Rescue Service crews attended four swift water rescues in the Gladstone region overnight. Full story here. 8.40am: Gladstone Region Local Disaster Management Group reports the flood level at Awoonga Dam has peaked. It's believed this level will hold for a number of hours. 8.05am: Floodwaters at Awoonga Dam are reported to be 8.26m above the dam wall. Power is set to be turned off in streets in low-lying areas along the Boyne River. 7.55am: Weatherzone forecaster Josh Fisher has told News Ltd conditions are easing around Gladstone as Ex-Tropical Cyclone Oswald tracks south. "In the past 24 hours we saw 176mm of rainfall but today there will be isolated showers in the area," he said. The heaviest rain for today is predicted to hit the Wide Bay Burnett, south of Bundaberg, and south-east Queensland, including Brisbane and the eastern parts of the Darling Downs. There is also the risk of more tornadoes developing. 6.30am: Boyne Tannum residents in the RL 7 areas and below are being advised to urgently evacuate their homes in the next hour. Gladstone Regional Council says the threat of inundation to these properties is likely as the high tide at 9am approaches. Some exits may be cut off, so residents should consider leaving now. Residents should prepare their property to be inundated, move to friends or family on higher ground or alternatively move to an evacuation centre at Tanyalla Conference Centre in Caledon St, which is providing refuge with food being provided by the Salvation Army, or the Boyne Island Community Centre. Click here for a list of affected streets. 6.15am: Gladstone Mayor Gail Sellers says 400 properties were contacted yesterday about evacuating, with another 300 last night and a further 500 homes this morning. The homes are in Boyne-Tannum, Pikes Crossing, South Trees and Benaraby. Another evacuation centre will soon open at Boyne Island Community Centre. 5.20am: Gladstone Mayor Gail Sellers has urged everyone living in low lying areas along the length of the Boyne River from the dam wall to the mouth to self-evacuate. "At around 7am in the morning there will be 7.9m of water going over the dam and this is the biggest we have ever seen," Cr Sellers said. Properties which may be affected include: 48717-49151 Bruce Highway, Awoonga Dam Road, Barklya Court, Baruby Boulevard, Rainer Court, Ronald Crescent, Stockman Drive, Thring Street, Wynard Avenue, Marrawing Road, McCarthy Road, O'Connor Road, Panorama Circuit, Protea Court, Dedekind Avenue, Denaid Court, Harbottle Road, Hennie Drive, Hoad Road, Irma Court, Jillaroo Close, Leferink Road, Manning Road, 5-23 Gladstone-Benaraby Road. "This means the saddle dam will operate shortly increasing the outflow from the dam. This will result in localised flooding on Awoonga Dam Rd, Pikes Crossing and nearby South Trees Inlet," Cr Sellers said. An emergency alert has been issued for Benaraby, following further releases from Awoonga Dam, which is now at 47.2m and rising. Boyne Island and Tannum Sands are now isolated, with both roads cut. An evacuation centre has been opened at the PCYC in Gladstone. About 150 residents have arrived there from Benaraby Caravan Park. The official evacuation centre for the Boyne-Tannum area is Tanyalla Conference Centre. Cr Sellers said there was no historical data for this event, because it had never happened before. A disaster management meeting will be held at 7am. A flooding emergency alert also has been issued for Biloela. The Banana Regional Shire Council is urging people in the low-lying areas of Biloela to evacuate to higher ground or to the Biloela Civic Centre. Residents are asked to take bedding and essential supplies. Very few resources are currently available to assist. People are also urged to keep roads clear. 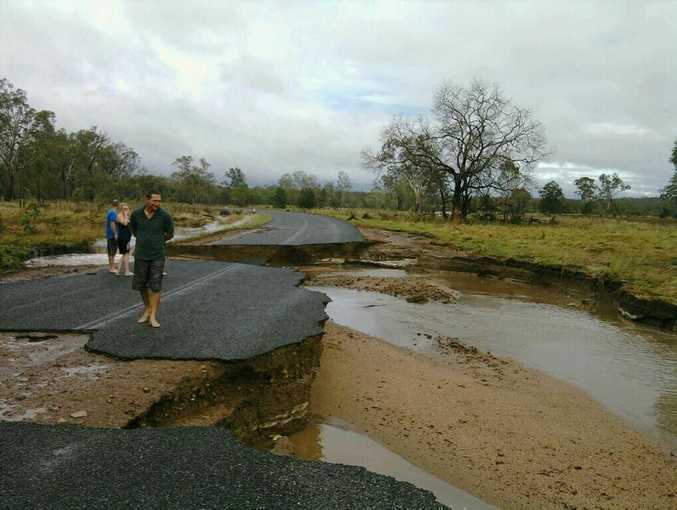 The Bureau of Meterorology said at 3am the centre of ex-Tropical Cyclone Oswald was about 20km east of Baralaba and 130km west-southwest of Gladstone. The system was moving south-east at about 15km/h and was expected to accelerate south south-east during today. Damaging winds with peak gusts of around 110km/h are possible over the south-eastern Capricornia district, particularly near the coast. These winds should ease within the next few hours as the system moves south. Heavy rainfall may lead to flash flooding and worsen the existing flood situation over the south-eastern Capricornia district. Locations that may be affected include Gladstone and Tannum Sands. Six hour rainfall accumulations of more than 100mm are possible, potentially leading to further rapid river and stream rises in the area.